The book examines innovation in environment-friendly technologies in the automobile industry. The focus of the book are Germany (a technology leader in the global automobile industry), on the one hand, and India, China and Brazil (technologically proficient emerging technology leaders) on the other hand. Patents have been used as a metric to measure and understand innovation. The book traces the evolution of regulatory standards in the automobile industry, relies on a unique patent dataset, and draws on a number of interviews conducted with regulators and engineers to get a better picture of how environmental policies and standards, including emission norms and fuel requirements, have developed overtime and now the industry has responded. The book’s core argument is that technological innovation is what has driven the industry in the past 125 years, but, at the same time, the industry has created problems and faced controversies with regard to its path dependency on carbon-intensive technologies. As a result, we have witnessed growing role of environmental regulators in ensuring that the growth path of the automobile industry, a powerhouse of growth of several economies, is aligned with the larger goals of addressing climate change and energy concerns. 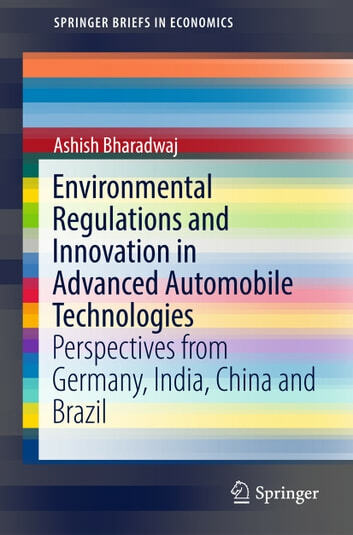 Against the backdrop of the emergence of Brazil, China and India in the global economy, the book focuses on the developments in these three countries, and draws parallels with Germany, which benefited from first mover advantage in technology and a substantial head-start in implementing cogent environmental policies. A standardized International Patent Classification (IPC) system has been used to, first, construct an index of regulatory stringency, based on regulations that came about between 1985 and 2010; and second, construct a unique cross-country weighted patent dataset for technologies invented in the past two and a half decades.